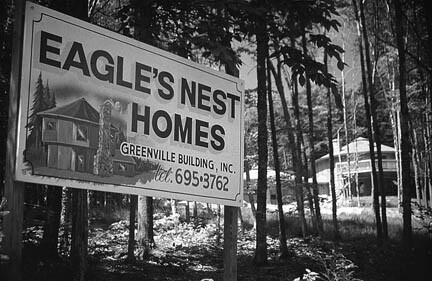 New house under construction in the Moosehead region. Photo © Jym St. Pierre. The forestland transactions database we compiled pro- vides information about flow of acres among landowner types, but it did allow an assessment of how many acres of timberland were owned by different landowner types at any point in time. An analogy might be derived from the stock market; trading might be heavy on a given day (flow of shares), but the S&P 500 can end up unchanged (i.e., acres within forestland ownership types remain unchanged). The landowner database for Maine that we obtained from James W. Sewall Co. (Old Town, ME) allowed us to calculate the degree of change in timberland ownership by landowner type at three points in time (1994, 1999, and 2005). Because 84% of all acres sold in the last 25 years were in Maine, the Maine GIS dataset provides an excellent description of the fate of forest industry landholdings in the region. In 1994, Industry represented the largest single land- owner type, with about 59% of the 11.7 million acres of Maine classified as major owners (>5000 ac)(Table 4). Old-line Family was the second largest owner type, with about 21% of the area. These two landowner types functioned in a similar fashion in that both appeared to be interested in long-term forest management. In 1994, Financial Investors only owned 3.2% of this area. Maine timberland ownership by landowner type in 1994, 1999, and 2005 (source, J.W. Sewall Co., Old Town, Maine). The table is complete through April, 2005. By 2005, Industry had decreased to 15.5% and Financial Investors had increased their ownership to almost 33% of the area (Table 4). A single large REIT (Plum Creek Timber Company) arrived on the scene in 1997, and now owns about 7.5% of the area (Table 4). New Timber Barons increased their ownership by 16-fold between 1994 and 2005, now owning approximately 435,000 acres, or 3.7% of the area. Logging contractors increased their holdings by about 2-fold during this time. Non-profit conservation groups went from 30,437 ac in 1994 to 352,179 ac in 2005, almost a 12-fold increase in ownership. Grouping several of the new owner types together (Financial Investors, Developers, Contractors, New Timber Barons, REITs), they now own about 5.2 million acres of timberland, or about 50% of the total area of our focus in Maine (Figures 6, 7). combined (blue) in Maine between 1994 and 2005. Using the Maine GIS data we examined whether ownership size was changing as a result of the many forest sales in the last 11 years. 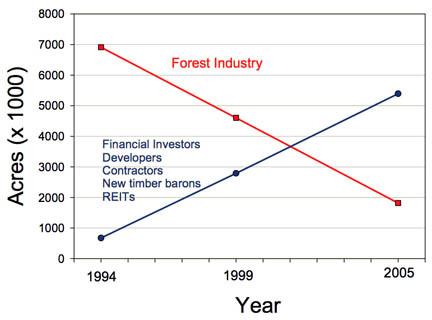 There was a noticeable increase in the number of forestland owners (> 5000 ac) and a decrease in the mean ownership size since 1999 (Figure 8). The average ownership size is still fairly large (118,000 ac), but the drop since 1999 is suggestive of increasing fragmentation of ownership. This means that management of the forest will be more fragmented and diverse. That could have either positive or negative implications for biodiversity. The key is understanding the forest practices of the various owner types (next section). Below is a selective listing illustrating the different patterns of ownership tenure in the region. Family-owned forestland has been the most stable ownership type during the last 25 years. J.D. Irving, although classified in our study as Industry because of its paper and wood manufacturing facilities, is actually a family-owned company, which may contribute to their long-term stability. Irving, here since the 1940s, has expanded its ownership substantially. Many owners came and went  they existed briefly during the 1980-2005 period and then vanished. Also striking is the number of longtime owners, part of the regions history, that vanished from the land- owner rolls after 1980 and especially after about 1990. Finally, the current landowner roster includes large areas owned by organizations entirely new to the Northeast. The information above is from the report Changing Timberland Ownership in the Northern Forest and Implications for Biodiversity by John M. Hagan, Lloyd C. Irland, and Andrew A. Whitman, a publication of the Forest Conservation Program of the Manomet Center for Conservation Sciences, Report # MCCS-FCP- 2005-1.